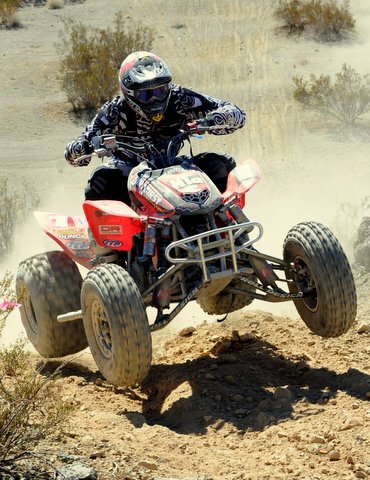 DirtFirst Racing’s Andy Lagzdins secured a second consecutive AMA National Hare and Hound Championship this past weekend at the SoCal MC promoted event in the Johnson Valley OHV Area. Andy rode his Duncan Racing powered Honda TRX450R to a second place finish behind Matlock Racing’s Josh Caster to score enough points to clinch the title with one round left to run in the series. Andy’s rival for the championship, Bill Markel, had an off day and could only muster a fifth place finish in an event that took its toll on racers and their machines. The race consisted of a 40 mile loop through mostly technical terrain. The course incorporated tight canyons that were only barely wide enough for the quads to fit through. Multiple bottlenecks occurred on the course, caused by broken and overturned quads and racers fatigued from lifting their machines around and over rocks and boulders. The lack of precipitation in the area made the conditions even more treacherous as dust proceeded to hide some of the upcoming obstacles. This is the fourth championship in desert racing for Lagzdins since coming out to the West Coast from Maryland in 2009. 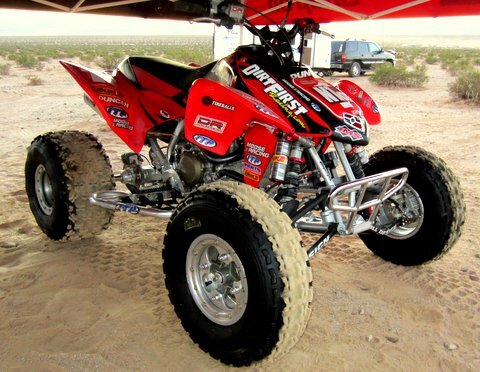 Team DirtFirst is sponsored by Christy’s Racing, Duncan Racing, ITP, Elka Suspension, Roll Design, Moose, Aplinestars, RPM Axles, TireBalls, and IMS Products.